See our downloads page to test our apps for free. The purpose of World is to provide a simple means of creating and editing landscapes in 3D applications. This is done using a common format called a height map and splats which are stored as bitmaps. 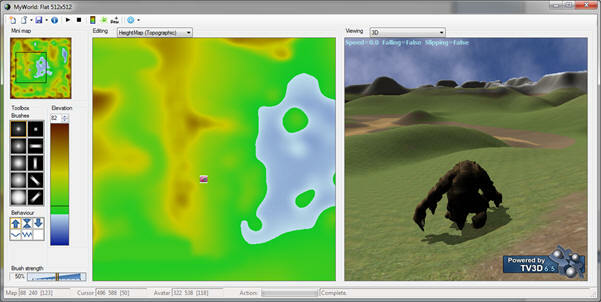 Most 3D engines use a greyscale bitmap to represent height on a landscape. Dark means low, white means high. This gives a height range of 255 which can be scaled and rendered in different ways by the engine. A texture can then be applied to this surface like grass; however this makes the landscape a bit drab. Splatting is a way to specify which part of the landscape has another texture applied. For example, a snow texture could be applied to the high parts only or rock to very steep areas. Creating a new map gives you the new map dialog as shown below. You can create a base profile across and up/down over the map. You can add hills to the base then etch them with rivers. Finally you can add noise and smooth the landscape. Splatting is a method of increasing the effective features of your landscape. Your base texture can be tiled across your map but it makes all areas the same. Splatting allows you to layer other textures on top of the base in selective areas. A good example of this would be snow on the peaks of mountains. A splat is a bitmap the same size as your height map that uses brightness and alpha to determine where the splat texture is applied. 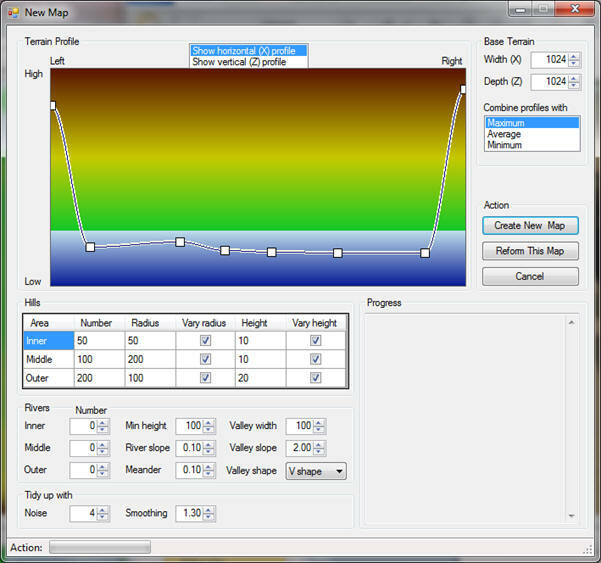 Initial loading of this form may be slow due to it analysing the height map for height and slope statistics.